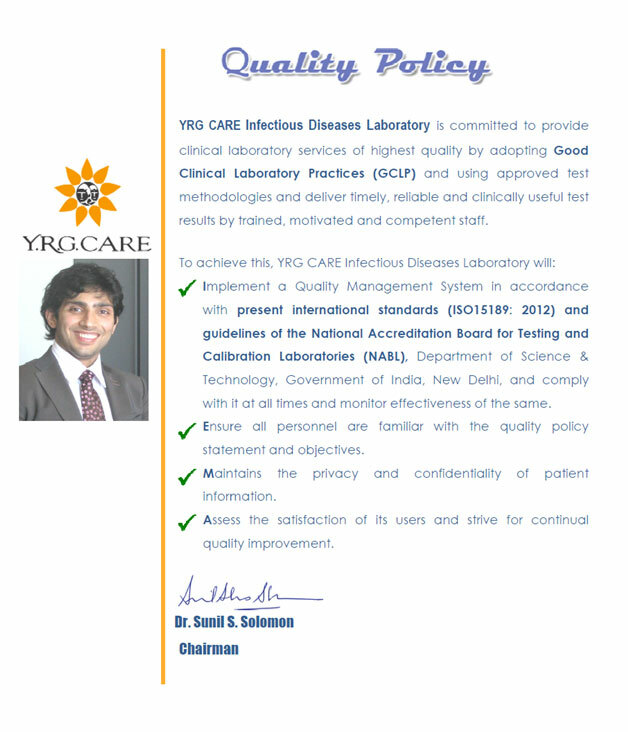 The YRG CARE Infectious Diseases Laboratory has adopted the ISO15189:2012 quality management system to provide the best world class diagnostic services to clients and patients attending YRG CARE clinics and for the samples referred from other parts of the country/world. The laboratory has received accreditation from the National Accreditation Board for Testing and Calibration Laboratories (NABL) for the ISO15189:2012 and NABL specific criteria since the year 2008. NABL is an autonomous body under the aegis of Department of Science & Technology, Government of India. NABL provides laboratory accreditation services to the laboratories which perform tests / calibrations in accordance with ISO 15189:2012 for medical laboratories.